While the Old Faithful geyser is one of the classic scenes in all the United States, it is not on every American's "must see" list. Yet it really should be! The geyser itself is spectacular, sending steamy mineral water about 100 feet into the air at about an hour interval: Expected eruptions of this cone geyser as well as others in the upper geyser basin are posted. Boardwalks and ample seating surround the geyser, and it is as apt to be visited by buffalo, elk, marmots, ground squirrels and other wildlife as it is by humans. 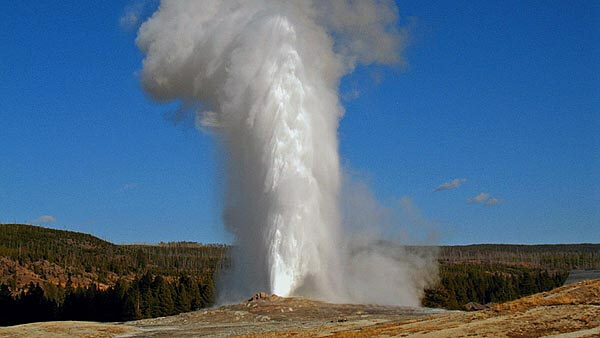 Old Faithful is situated in northwestern Wyoming in Yellowstone National Park: It is an easy drive (about two hours occupied with stunning scenery) from Cody, Wyoming to the east and Jackson Hole Wyoming to the south, so these are easy airports for arrival and departure. Traveling from Jackson Hole, visitors pass through Grand Teton National Park, which is worth enjoying as well. Cody has a fantastic museum that is well worth visiting, and the drive to Yellowstone passes Pahaska Teepee, a hunting lodge of Buffalo Bill Cody: A-frame cabins and an excellent restaurant are found here. Old Faithful is part of the geothermal greater Yellowstone caldera system. Easy walks and day hikes from this geyser take the visitor by many other geothermal features, including other geysers, bubbling mud pots and wildly colored pools. It is essential to stay on the boardwalks and pathways, and it is extremely important to heed park rules regarding not interacting with wildlife. The Old Faithful Inn, next to the geyser, is one of the country's most beautiful historic hotels and inns. Reservations are required well in advance, but staying there is very memorable and well worth planning ahead. The restaurant in the inn is superb, both in hospitality as well as excellent cuisine. The Park's antique yellow buses are back in service and my be ridden on scheduled tours leaving from the Inn. during the summers, the Old Faithful Inn hosts one or more artists in residence, notably the watercolor painter James Reed. Last updated by Pat Henking on 22 April, 2010 in Destinations.